Industrial Plastic Solutions are your go to guys when you need Custom Acrylic Display Cabinets. All cabinets are made from quality Perspex sheets as well as the more standard cast acrylic sheets. We are happy to Plastic Fabricate any type of Acrylic Display Cabinet your business or company may require. • All cabinets come with quality finish & fittings. • Locks & hinges provided upon request. Edges are polished to look like glass & have all sharp edges removed to increase the safety factor to general public. We can make all types of Acrylic Display Cabinets. Used as high end item displays with numerous shelves giving your items a flashy & professional display look. Perspex thicknesses vary upon the size of cabinet & are chosen by our experienced staff to suit your individual cabinet from 3mm to 4.5mm or 6mm thick. For larger cabinets 12, 15mm is also available to give added strength. Call us for a free quote and help with your design as we are often able to come up with innovative ideas for display cabinets or stands. We also Plastic Fabricate custom containers with various dividers to suit. Lolly and nut containers are our specialty with a no hinge design which improves container shelf life. Using our state of the art Cnc Router we can cut all panels to an accurate size ensuring a high standard of quality with improved edge finish. You can be assured all cabinets made are the same whether you order one or twenty. Acrylic Display cabinets are especially used within the food industry to display all types of cakes & savories & food stuffs due to acrylic being food friendly and easy to clean. 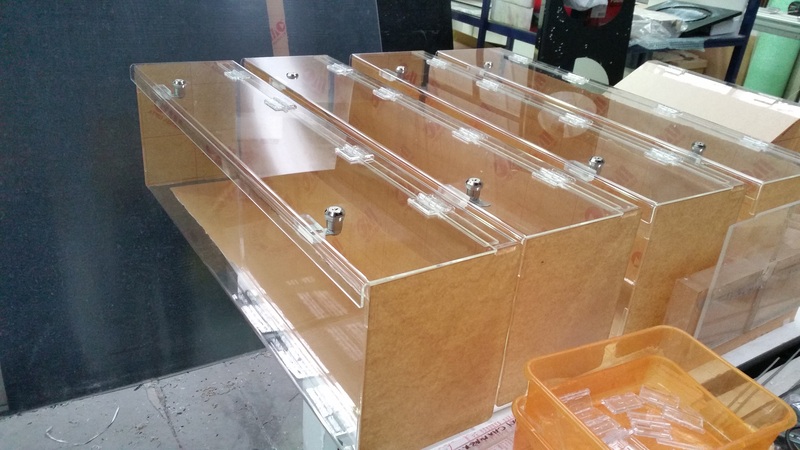 Industrial Plastic Solutions are happy to Plastic Fabricate Acrylic Display Cabinets and ship them interstate. Please feel free to call us for a free quote from one of our experienced Plastic Professionals.